I’ve never liked keeping a Diary, I really hated keeping a Journal while in college and I’ve never been good about keeping track of events in school that I might need notes on later. Now that I am older though I wish I would have actually kept that journal from my college days – the one with where I’d traveled to, places I ‘d visited and my thoughts on my life then. I think it might be a good idea to keep notes on interactions with students/parents throughout the school year. How is a good way to do this though? How do I keep my professional life separate from my personal life without driving myself crazy. 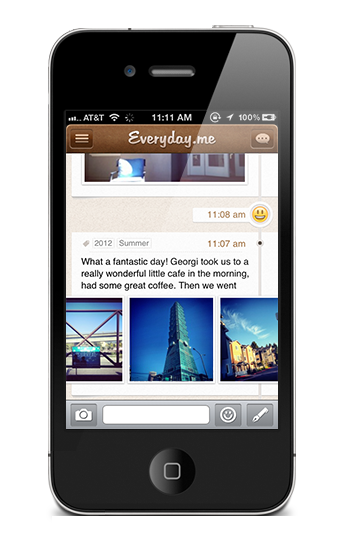 EveryDay.me is a new iPhone app/website that has decided to throw it’s hat into a very crowded sea of possibilities. This app is meant to be just for you. It’s a personal app allowing you to write about your day, let’s you keep photos, videos, and even those little face’s saying you were happy or sad or whatever. All of this is only for you. It is all a private record of your life experiences. Right now users can link Facebook/Instagram and Twitter to their timelines. Posts to those services will be automatically pulled into your EverydayMe. You can also email a post to EverydayMe – use the same email account as your EverydayMe account and send an email to post@everyday.me which can be useful if your iPhone is not useable at the moment. The web site Everydayme.com allows you to only view your entries and change a few settings. The web site is not meant to create entries. The next release will allow Foursquare, Tumblr, FitBit and Nike+ integration. This daily record of your daily life is available online and of an iPhone app. Android and other mobile apps are supposedly in the works, as are printed “quarterly and annual reports” with highlights and statistics. EverydayMe is meant to be only for you to keep track of what is going on in your life. Path is another iPhone app (also Android) that allows you to create a timeline of your daily experiences that is shareable by up to 150 people. It is meant to be very personal still in that your timeline is not searchable online, in fact you can not even view your timeline on the web! The website allows you to adjust settings for your profile but that is it! Your default profile is set to Private. Path allows you to check in to a location, post your thoughts of the day, post pictures or videos, share who you are with and while creating a Path entry you can also post to Facebook, Twitter, FourSquare and Tumblr. 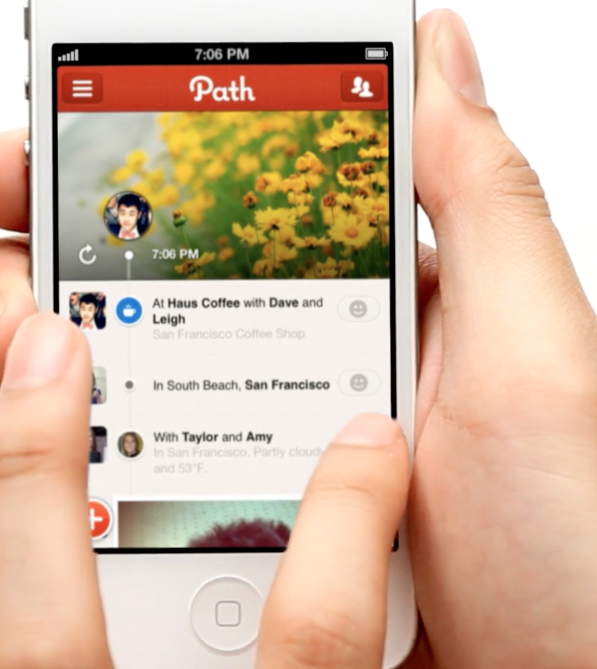 Path allows you to interact with your other friends. It also has options to indicate when you go to bed and wake up. Path draws my attention because I do like sharing my social life with other – just not as many people as I would if I was using FaceBook. Path is much easier to control the privacy from as well. Path is a beautiful app to use, browse through your past history and it is the app I compare all others to for pure aesthetic beauty! I really am anxious for Path Developers to create an iPad version as well as allowing people to view my timeline form a web browser, IF I give the link to them of course! Of course Path is not someplace where you should be posting about the latest problem you had at school with Johnny! These next apps are possible choices for that sort of instance though…. These apps are personal journals/diarys. First up is another iPhone app – Momento – a quick and easy way to write about what is going on in your life. It is quick to write a post, insert a photo to go along with that post, tag it with the people involved, attach a location and even tag events or create other custom tags that are later searchable. What drew me to this app the first time was that Momento also brings in many of the social feeds you may already be generating on a daily basis. So as I post to Twitter those posts are sucked into Momento. 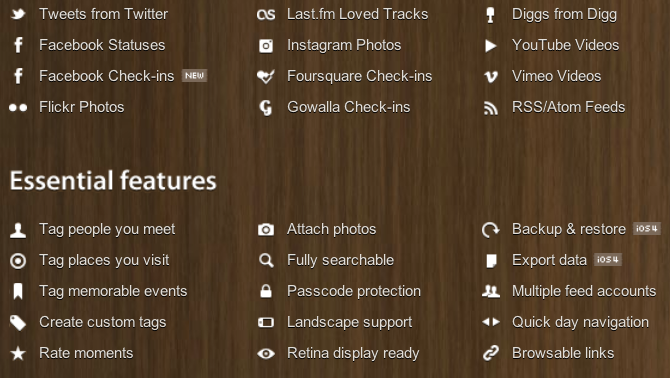 There are a ton of these social integrations in Momento – Here is a section from their website. If you use social media and want many of those feeds integrated into your diary then this app may work well for you! The only thing to be aware of though is that this app brings IN social media feeds but it does not SEND OUT. In other words, if you want to tweet then don’t try doing it from Momento or if you want to check into FourSquare then use the FourSquare app! This is the last app I am including in this post. I thought I would be very remiss if I did not include one app that was made for the iPad though. I tend to write my experiences from my iPhone because it allows me to include pictures that are better quality that are also GPS embedded. But if you are like me then you want apps that are made for iPhone, iPad and even having a desktop/laptop version of the software is a huge bonus! I have not used this app but am thinking about trying it out because of the fact that mentioned above! This is the app that reminds me the most of an old fashioned journal with a good twist of modern included. It looks like it would be a great looking app. This would also be the best spot I think to keep track of daily interactions between students, parents and other school related activities. I don’t think though that there is a good way to keep all your school stuff separate from your personal activities. I am sure there are even better ways to keep track of your daily life vs your school teaching life. Leave me comments below please about which apps you are using to fill this slot.